The original image (left), the image slowed for 6 microseconds (middle), and the image stored for 2 microseconds (right). The technique to improve image resolution was not used for these images. Credit: M. Shuker, et al. ©2008 APS. Books are written on solid pieces of paper for an obvious reason: the atoms in a solid don’t move around much, keeping the words and pictures in place for centuries. Trying to store letters and images in a gas medium, on the other hand, seems a little far-fetched. Atoms in a gas are constantly moving around, which would move the images around with them. But physicists from the Technion-Israel Institute of Technology in Haifa, Israel, and the Weizmann Institute of Science in Rehovot, Israel, have recently demonstrated how to store images in a warm atomic vapor. With their method, which is based on electromagnetically induced transparency, the researchers could store complex images for up to 30 microseconds in rubidium vapor. To improve the resolution of the retrieved images, the physicists also developed a method to minimize the effect of the diffusion of the gas atoms on the images’ visibility. Images stored for 30 microseconds. The left table shows actual and predicted images without the technique to improve image resolution. The right table shows actual and predicted images with the technique to improve image resolution, where a phase shift was applied to cancel light emission between the lines. Credit: M. Shuker, et al. ©2008 APS. In their technique, the researchers first stored an image (for example, the number “2”) in a light pulse. When that light pulse hits a gas of atoms, it is strongly absorbed, and excites the atoms. But when a second light beam is aimed at the gas, it drives the atoms to a unique quantum state, and causes the first pulse to pass through the vapor. This phenomenon is called electromagnetically induced transparency. As previous experiments have shown, when the second light beam is shut off while the first pulse is inside the vapor, the first pulse can be completely stopped (and be temporarily stored inside the vapor). Then, by starting up the second beam again, the first pulse can be recovered. Here, the physicists used this method to capture, store, and restore complex 3D light fields. 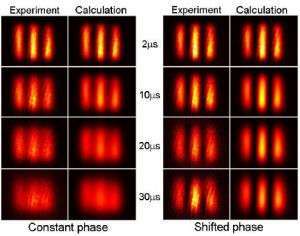 The scientists slowed images on a light pulse to a group velocity of 8,000 meters per second, a velocity that allowed the images to be stored in atomic vapor for several microseconds. They directed two light beams to a 5-cm-long vapor cell containing 52°C rubidium gas and a neon gas for buffering. Once half of the first light pulse (containing the image) had exited the vapor cell, the researchers turned off the second beam, so that the remaining half of the image was stored in the vapor. As the researchers explained, during storage, the image was encoded in the quantum state of the ensemble of atoms. After 30 microseconds, the researchers turned the second pulse back on, and the image was then recovered as it left the vapor cell. Due to the diffusion of the gas atoms, the recovered images looked somewhat blurry and had a decreased signal-to-noise ratio. To improve the image resolution, the researchers developed a technique to minimize image degradation caused by the movement of the atoms. The technique is similar to the phase-shift lithography technique used to reduce optical spreading, where the phases of neighboring image features are flipped so that light between them will interfere destructively. The researchers shifted the phases of image features by 180 degrees, so that atoms of opposite phases that diffused to the areas between lines in the image had amplitudes that cancelled, and no light was emitted that blurred the image lines. Storing images in vapor – or, as the researchers describe, “converting optical information to atomic coherence” – could be useful for various image processing and correlation applications, as well as quantum information processing and even quantum communication. The scientists also predict that it should be possible to store more elaborate images, including temporal images, or movies. “The storage-of-light technique (generally, not only images) might have important applications in future quantum information devices,” Shuker said. “The most ‘straight-forward’ application is a ‘memory device’ for the basic information unit of quantum information – the qubit. More information: Shuker, M.; Firstenberg, O.; Pugatch, R.; Ron, A.; and Davidson, N. “Storing Images in Warm Atomic Vapor.” Physical Review Letters 100, 223601 (2008). I think Easy Cheese might be a better medium than vapor though. You'd have to open he book very slowly and hope theres not a breeze. I wonder if this sort of research, and also the work done by Lene Vestergaard Hau ( http://www.seas.h.../haulab/ ) will bi-product into a freeform holographic projection type of image display.